I am loving anything berry lately. We kind of get deprived of berries in Minnesota for about half the year, so when they are available, I am all over them. I recently made some blueberry jam from a couple of pints of blueberries, and instead of simply using it to top toast with, or stir into oatmeal, I thought that a delicious dessert was in order. I decided on some jam bars. They were one of my favorite things growing up. 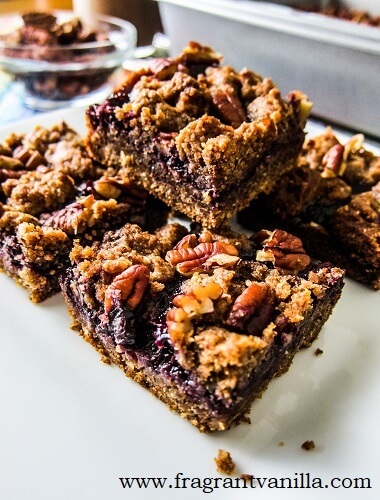 I mean, what's not to love about buttery bars with a streusel topping and jam filling?! I almost always include a nut butter of some sort in the ones I make now, even though, I don't think the classic ones had it. It just makes them even more delicious, you know like a good PB and J sandwich but dessert. I usually go for peanut butter, but since I was using blueberry jam for this instead of raspberry or strawberry, I decided on pecan butter. Blueberries and pecans are heavenly together! 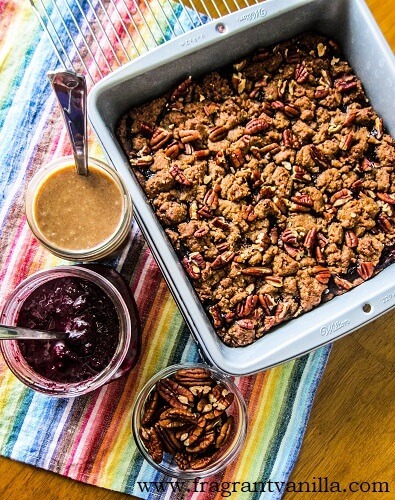 These are actually pretty easy to make if you already have the jam on hand. The dough is kind of like wet cookie dough, and it was super delicious even before it was baked. I should know, I sampled enough of it. I can not resist cookie dough (I know it isn't technically cookie dough but you get the idea). I used Bob's Red Mill gluten free all purpose baking flour for these, but you would never be able to tell because it tastes just like regular flour once they are all done. 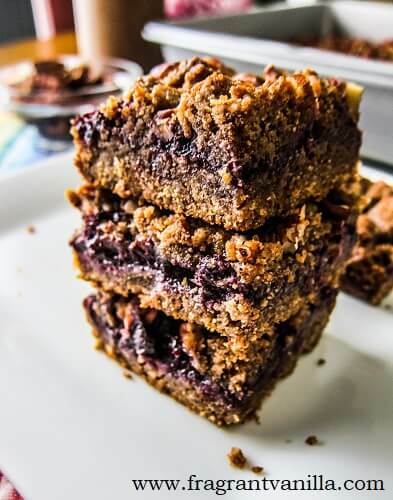 I actually combined it with half pecan meal though, because I wanted these to be extra rich and delicious and I love adding nut flour or meal to my cookies, bars and pie crusts. It just makes them over the top good! They smelled heavenly while baking, and I could not wait to try them. But unfortunately I had to wait until the next day because they would not look so nice if I just dove right in. That is the only bad thing about having to take pictures of your food. Having to wait. Waiting for it to cool so that it looks nice when cut. I totally used to dive right into stuff when it wasn't set before I was a food blogger. These were worth the wait though and they were the perfect post work treat last Friday. I get excited about this type of stuff if I know I have it waiting for me at home. These are sooo good! The sweet, gooey jammy blueberry filling is perfect with the crispy buttery nutty pecan struesel and crust! 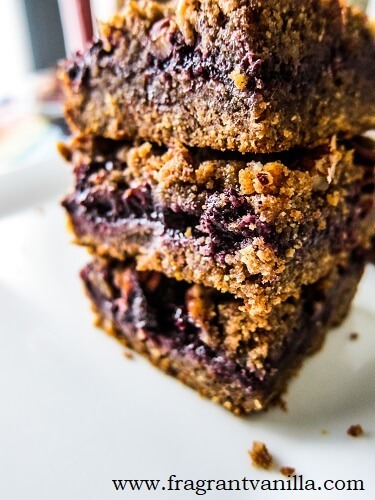 If you have some blueberry jam on hand, these are a must try! Preheat oven to 350F degrees with the rack set in the center position. Line a 9x9 inch square pan with parchment, and/or grease it with coconut oil. Whisk the coconut oil and sugar together in a bowl with the vanilla and flax mixture until the sugar starts to dissolve. Then add the pecan butter and mix until combined. Add the flour, baking powder, sea salt and stir in until well blended. Spread 2/3 of this mixture over the bottom of the pan, pressing it to the edges with your fingers. Then spread the jam over that with a spoon or offset spatula. Drop chunks of the remaining dough over that, and sprinkle with the pecans. Place in the oven. Bake for about 45 minutes until lightly browned and set. Remove from the oven and let cool completely before cutting into bars. 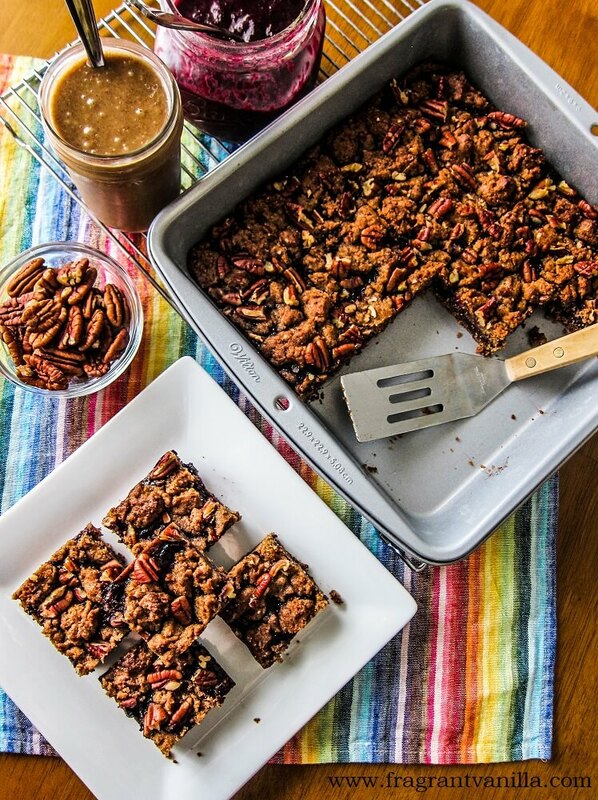 *Make the pecan meal by blending pecans in a blender just until they become fine like flour (but not too long or you will start to get pecan butter).